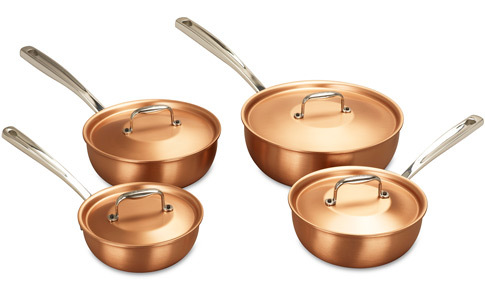 Providing four popular sizes of saucier pans with lids, our copper saucier set is ideal for recipes that require frequent stirring. With curved sides to ensure vital ingredients are incorporated completely, these practical sauciers perfect the art of sauce making. The superior heat distribution of copper provides accurate temperature regulation while the stainless steel linings assure you of pure flavour intensity. Contemporary stainless steel handles and unique brushed surfaces for ease of care.